Isn’t healthy comfort food just what you need after Christmas? I’ve been eating chocolate all day since boxing day. We had stuffing made with butter, a lovely rich goose, streaky bacon stuffed with cheese and all manner of other rich goodies in our Christmas dinner. It was amazingly tasty, and it’s only once a year. I wouldn’t change it for anything. When the leftovers are eaten, though, it’s a great time to start some healthy habits – but without the faff of calorie counting, restrictive diets or constant lettuce munching. I love a good bowl of comfort food, especially this time of year when it’s cold and there’s so little light. If I can’t hibernate, I’ll take warming food instead. 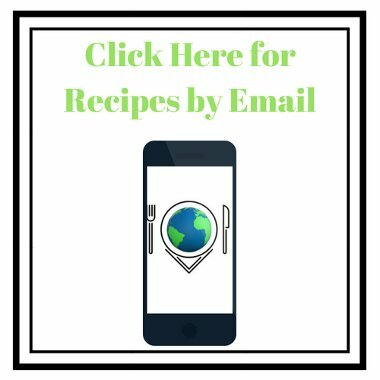 So here I bring you a selection of techniques that you can use to make warming healthy comfort food but with no added fat. I can’t guarantee they’re all low fat or healthy in every way. However, with olive oil packing in 120 calories per tablespoon and butter 102, they may just help ease your conscience and your waistband. 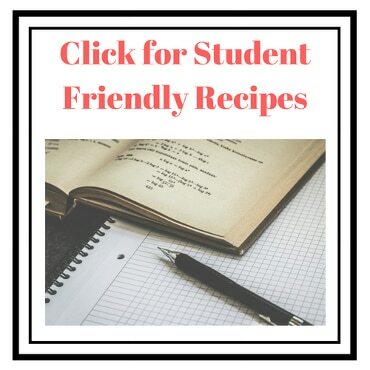 I love recipes that can just be slung in the oven with only a little preparation. Whilst roasted and baked foods often have oil or butter added to stop them sticking or add to the flavour, there are may other ways of making food taste good. 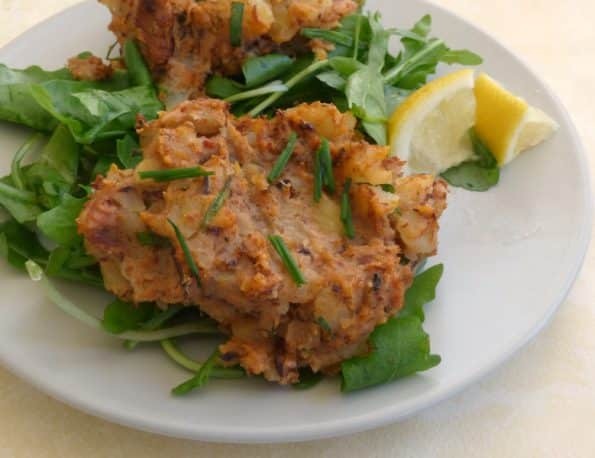 I love my Granny’s fishcake recipe, but by baking them instead of frying them, you get all the yummy fishy flavour with less fat (and they stick together better). So long as you have non stick baking pans or a little oil or cooking spray to stop them sticking you’re set. Check out the recipe here. 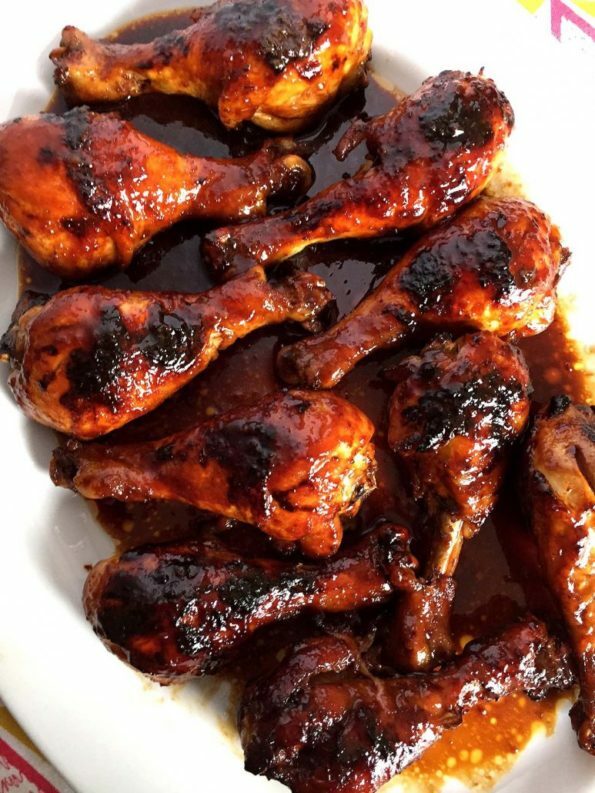 To add a more oriental feel to your healthy comfort food, this honey soy bbq chicken is a lot less hassle than stir frying or grilling. Rather than coating the chicken, Melanie from Melanie Cooks mixes a sauce to cover the chicken. It then goes lovely and sticky while you sit back and relax – perfect for sharing with friends. I bet burgers sound like they’re a lot of faff to make from scratch, don’t they? 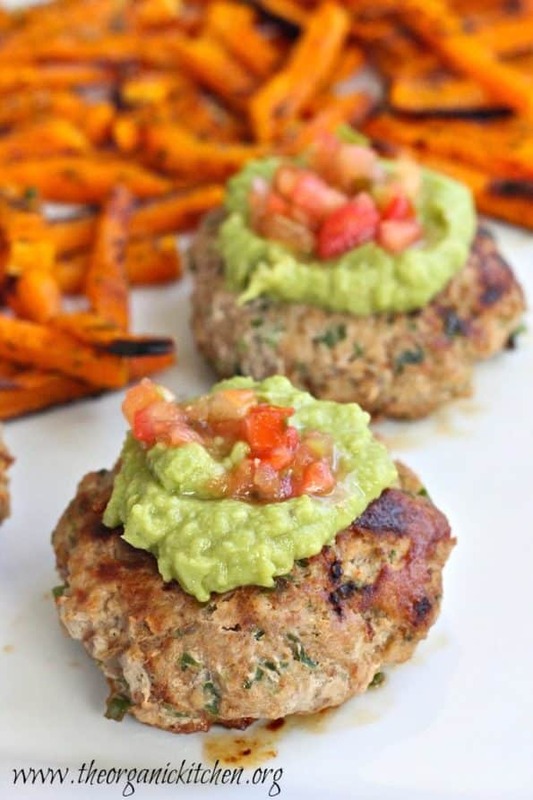 Well, Linda from The Organic Kitchen has cooked up these Japaleno Turkey Burgers that are really low effort for comfort food as well as being low fat as they cook in the oven – just mix ’em up and cook them. No fat to fry, no sitting watching the grill/broiler. How many soups are full of rich creams and butter, or start with sauteeing in oil? 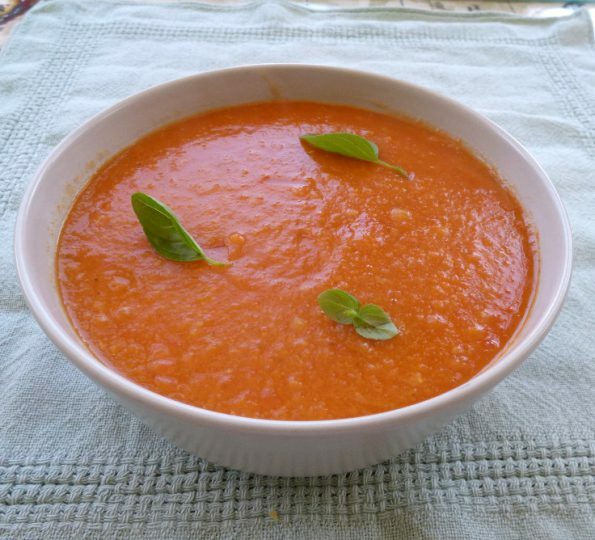 If you want to take a break from fatty foods there are plenty of ways to add flavour to a soup without oil and butter. If you add all the ingredients at once and just boil the soup it doesn’t mean you will end up with an inferior meal. I love roasting the vegetables first to get that extra special flavour, without any hassle or added fat. You don’t need oil to roast vegetables, and the roasting often makes them easier to cut and peel. 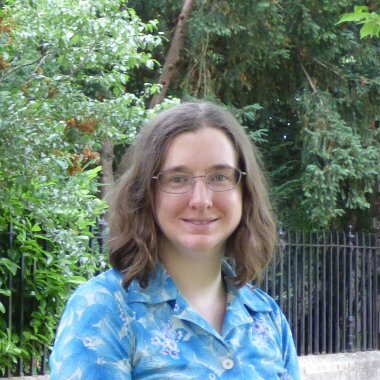 I even wrote a guide about it here. One example of this method of making healthy comfort food is my roast squash soup. It’s a really simple recipe that conjures up sunny Mediterranean flavours to keep you warm in the middle of winter. Maya from Wholesome Yum uses a similar technique for this chicken and spaghetti squash soup, roasting the squash for a low fat, low fuss, low carb version of chicken noodle soup. The chickeny flavour and mixture of textures mean you really won’t miss the fat. I’ve never cooked with spaghetti squash – Maya makes it look so easy I think I’ll have to give it a go! Another easy way of making tasty comforting soups without adding fat is to make good use of spice. Simply boil your key ingredients up with a vibrant mix of spices to create your flavour. 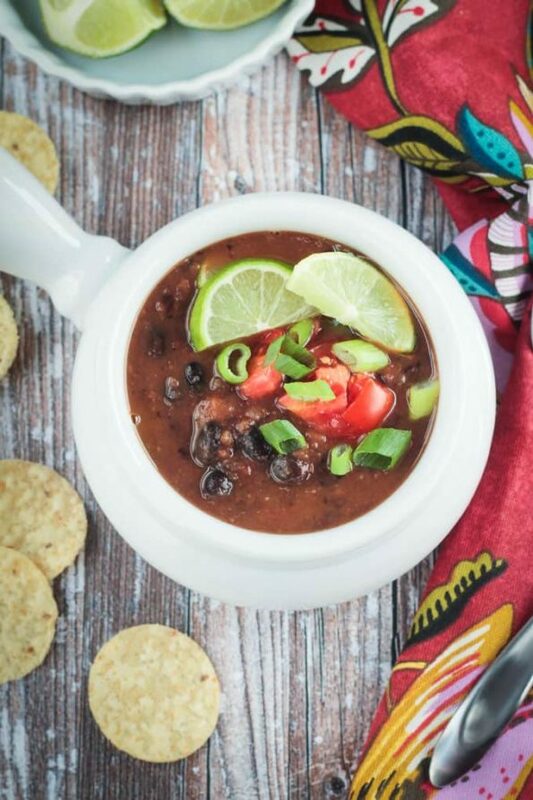 Jenn from Veggie Inspired has chosen a Mexican flavour for this black bean soup. Yum, I love Mexican inspired food! Black beans are so inexpensive this is sure to be a January hit. 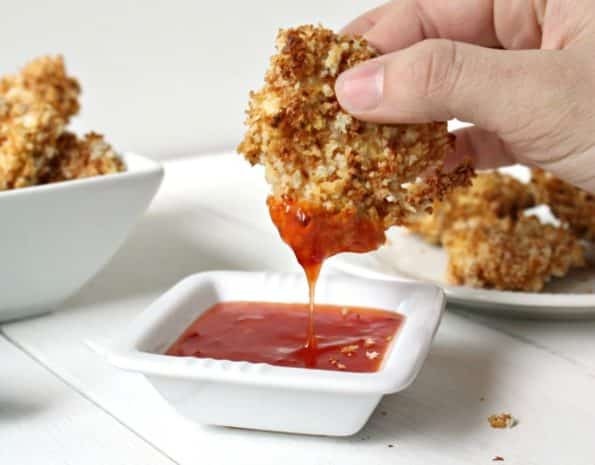 Even better, it can be made in just 30 minutes. 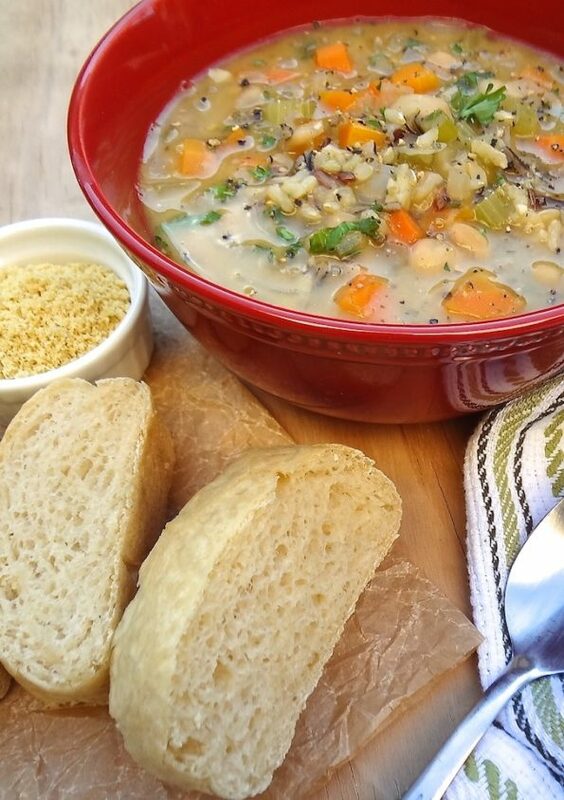 In a variation on this theme, Marlena from Where You Get Your Protein uses a mixture of miso, fresh herbs and nutritional yeast to add a fresh, umami flavour to this vegan wild rice soup without any extra frying. 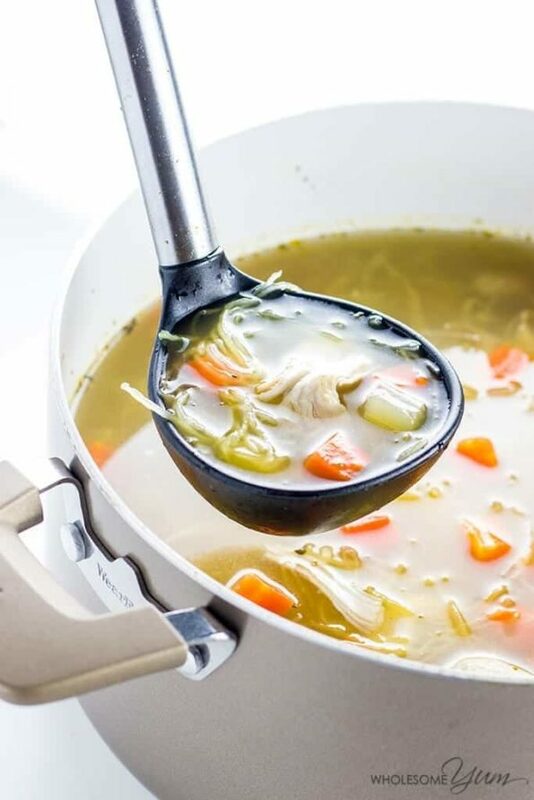 To soften the vegetables Marlena sautees them in a little vegetable broth, locking in all the aromatic flavours of the vegetables without adding many calories. 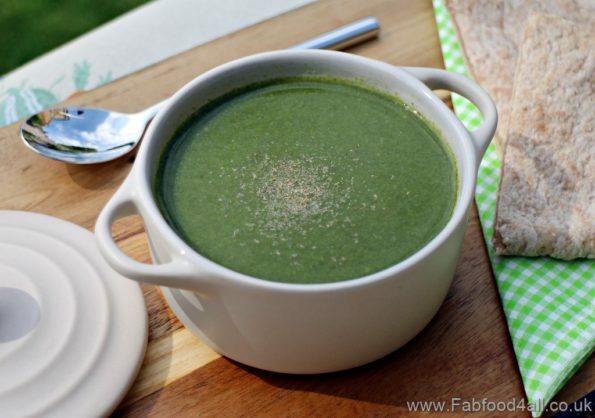 Camilla from Fab Food 4 All makes a really simple spinach soup using the natural flavours of spinach and potato, with a helping hand from a little garlic and nutmeg, to produce a full flavour with no added fat or complicated spices. All the ingredients are cooked in together from the beginning making it a really simple soup to make. You really can’t beat potato based soups for comfort food. 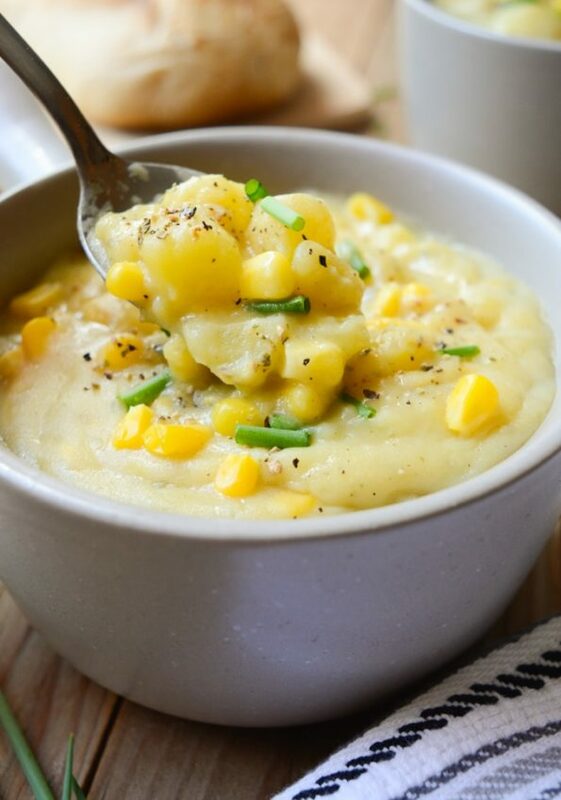 Marlena from Where You Get Your Protein adds all the ingredients for this Vegan Corn Chowder together. With ample garlic, parsley and thyme and plenty of veg, this soup is full of flavour and healthy too. It’s useful sometimes to sautee some of the ingredients for a recipe to soften them up, so to avoid adding fat you can use broth or water to do this like Marlena does in the wild rice soup above. This technique isn’t just for soups though. 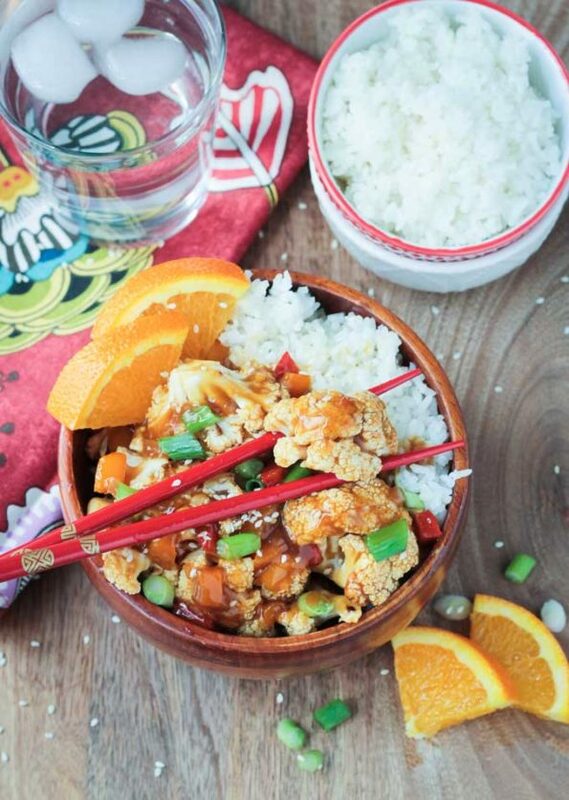 Jenn from Veggie Inspired has created a healthy Asian style orange cauliflower recipe. The cauliflower is roasted to cook it through without adding fat, and the onion and peppers are sauteed in a little broth. This makes them nice and soft before the sauce is created. This meal looks positively decadent, and all with no added fat. I’ve sometimes added a little water after the oil runs out – I’ll have to try sauteeing in just broth or oil. I love a good curry, don’t you? 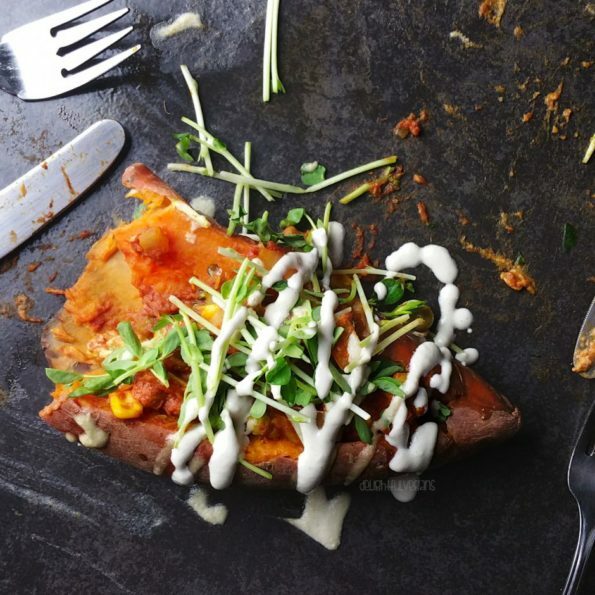 Josh and Katie from Delightful Vegans make a korma then stuff it into a baked sweet potato. It looks like proper indulgent comfort food and full of flavour. However, the vegetables are sauteed in water rather than oil. This keeps the fat content down without sacrificing that all important taste. In the same vein, the garlic tahini dressing is blended up with water rather than oil. Even quite lean meat can be cooked in its own juices with no added fat, like the turkey burgers pictured above. You can even drain off any excess fat this way. I never add extra fat to mince/ground meat, even if it’s fairly lean. Enough liquid comes off the meat in order to brown it. 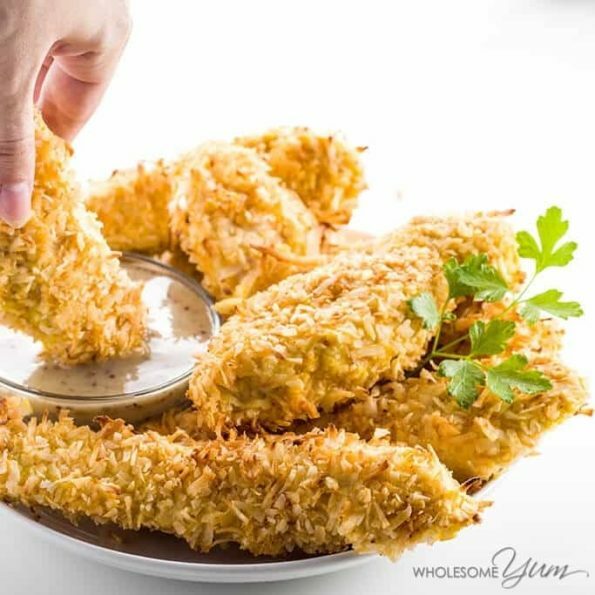 It’s so easy to add extra fat to meat just out of habit, but if you are watching your fat intake this January try dry-frying your meat to brown it. 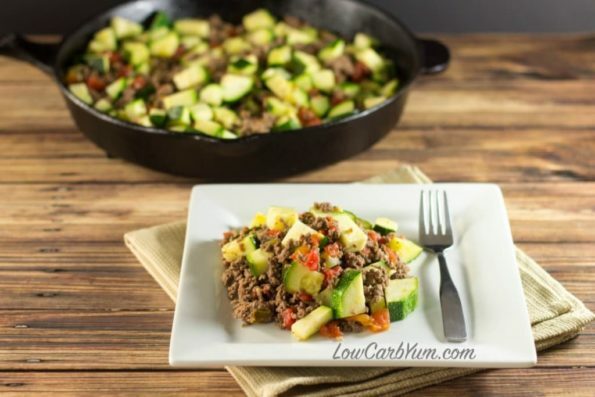 It’s ground meat that Lisa from Low Carb Yum uses to make this Mexican Zucchini and Beef, cooking the meat in its own juices with garlic, salt and pepper. What a great way to flavour the meat, without adding calories! Healthy comfort food doesn’t have to be boring. 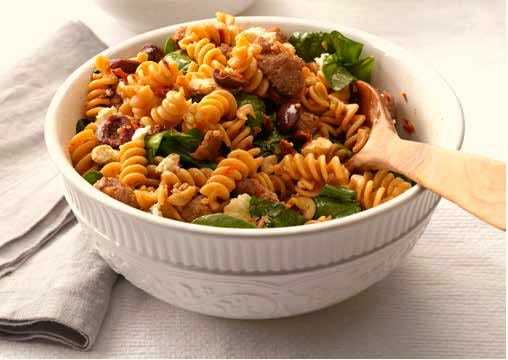 Terri from Food Meanderings uses a similar technique to crumble sausage meat and brown it, before adding other ingredients to make a Greek style pasta dish. What a wonderful combination of flavours! And this recipe is so quick the meat won’t have the time to dry out. Patrick from Looney for Food cooks this Healthy Turkey Chili in the slow cooker but browns the ground turkey first, using no added fat. This will speed up the cooking time, and means that it can be made just the same on the stove top. 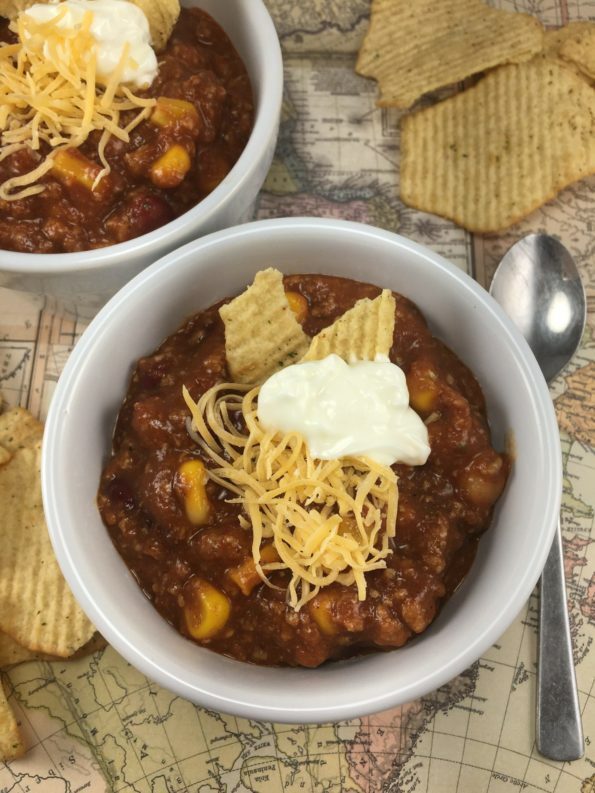 This chili can be used to make three different meals, so it looks like a great recipe to have under your belt. 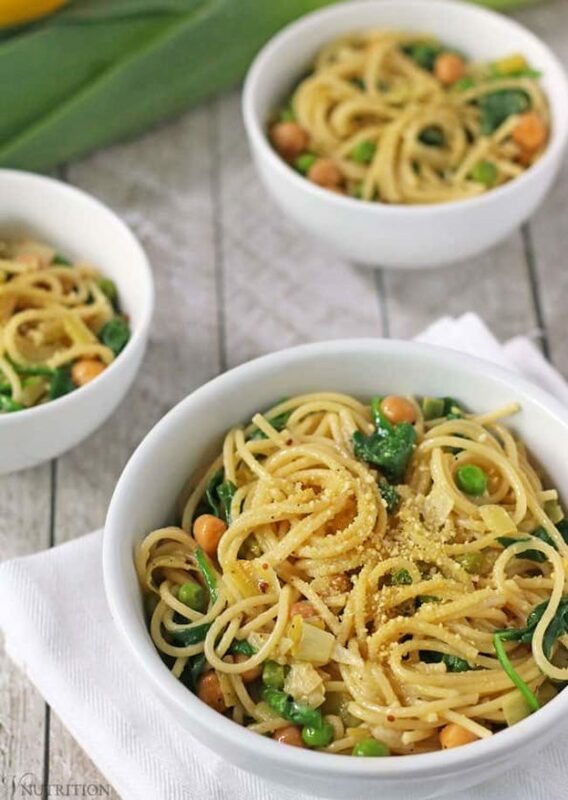 The ‘bung it all in and boil it’ technique that we discussed for soups can also be used to make all kinds of other healthy comfort food dishes, such as Mary Ellen from V Nutrition’s Lemon One Pot Pasta. 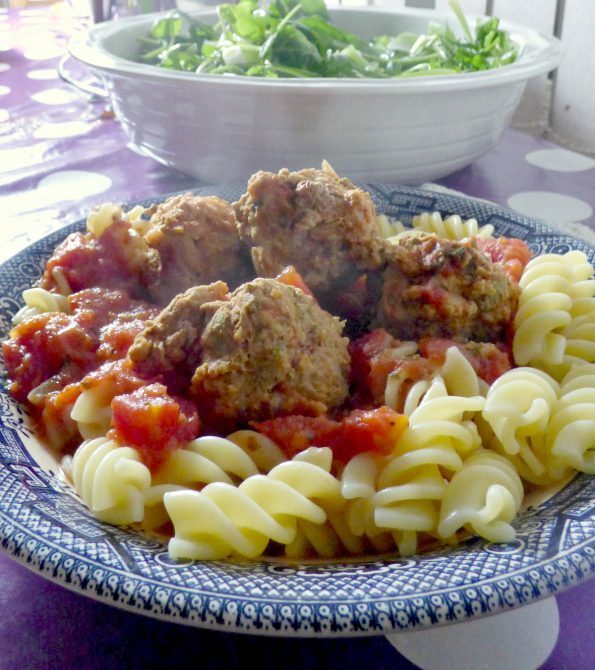 The pasta and other ingredients are all cooked in together, meaning no added fat and less washing up too. 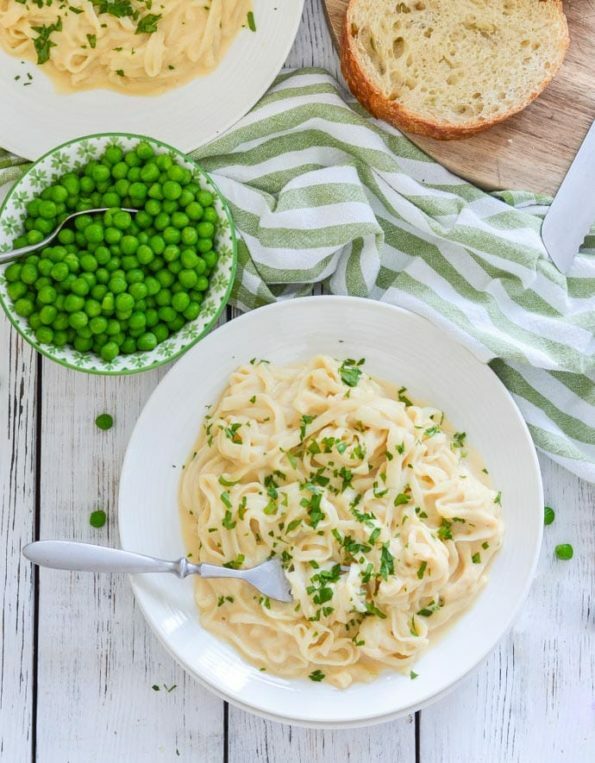 Mel from A Virtual Vegan uses a blender to create a Cauliflowr Alfredo sauce without using butter. 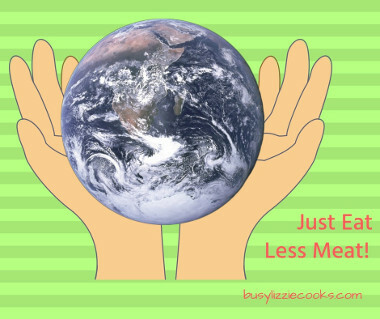 This makes it vegan, as well as reducing the fat content. It’s both really simple, and packed with goodness. I’m not vegan, but this looks like one yummy sauce. 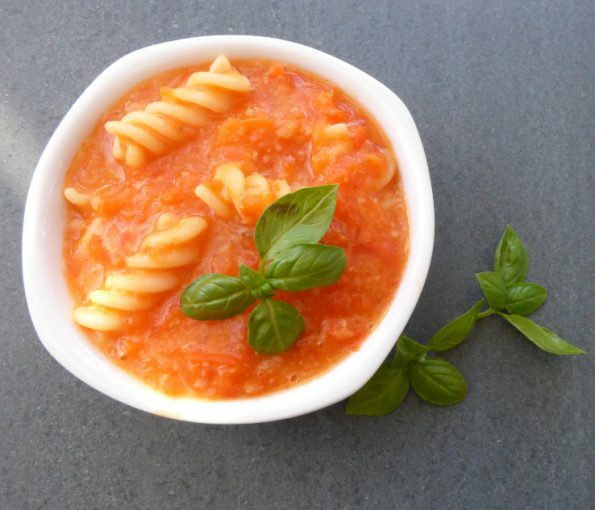 I also like using the blender for pasta sauces – my Roast Pepper and Cannellini Bean Sauce uses the blended beans to add a creamy texture, without needing any fat or dairy products. The perfect way to get extra nutrients into fussy kids, and with a food processor it’s so easy to make. Slow cooking is the perfect technique for making healthy comfort food. As well as making life easier, it’s a great way of cutting down on fat because that long cooking time means the flavours get ages to develop and infuse. You don’t need to brown anything to bring them out (though it can save time). I very, very rarely brown ingredients for the slow cooker. I just add everything together, and use hot liquid. 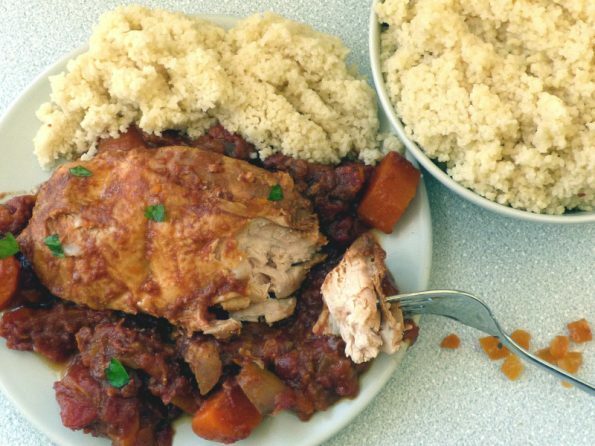 My warming Moroccan Chicken recipe, for example, uses no browning, no butter, no sauteeing for the sauce. Melanie from Melanie Cooks makes a beef chilli in the slow cooker. 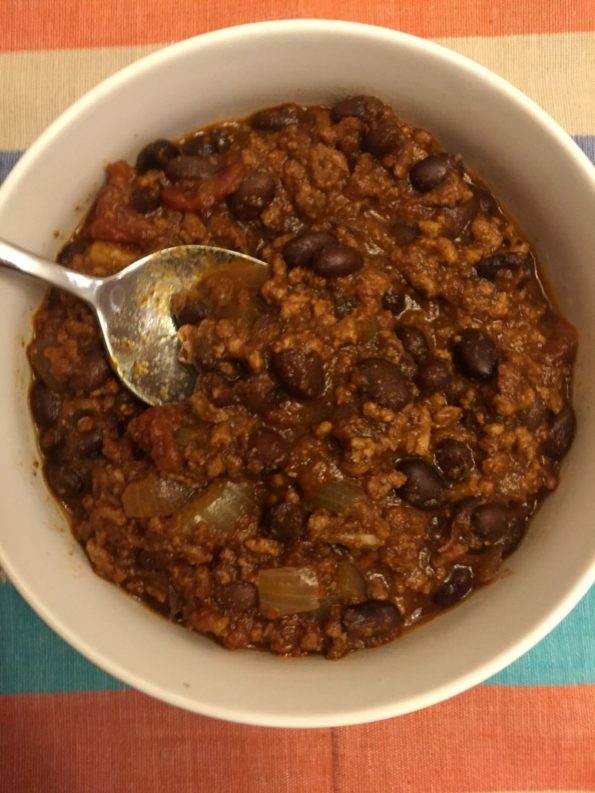 If you haven’t tried slow cooker chilli, the long cooking time really does make the flavour something else. And if you feel like a treat top with sour cream, cheese and green onions as she suggests. Perfect for cold winter evenings! 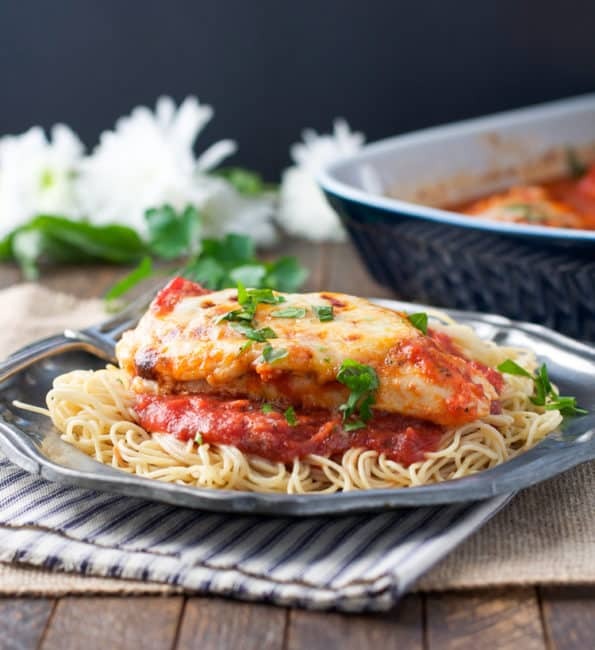 I hope you’ve enjoyed this roundup of healthy comfort food with no added fat and it’s given you some ideas for how to indulge in some lighter comfort food! If you’ve enjoyed it please share or leave a comment. Thanks to all who’ve contributed recipes – please do click through and click them out. Thank you for including my Black Bean Soup and Orange Cauliflower! Happy New Year! I'm glad you like it, thanks for contributing!